I am grateful for your kindness, assistance and professionalization during our sessions. High Chantal , My divorce went through today. The judge today said that he has never seen such a perfect and child centered parenting plan in all he’s years. My divorce went through yesterday thanks once again for all your kind assistance, I could not have overcome this overwhelmingly daunting experience without you. I will without a doubt recommend your warm services to friends and family. Thank you very much for your help in facilitating our divorce. I really appreciate your impartiality and you professionalism in handling our divorce process. Thank you for generously taking on our case pro-bono. Your gentle yet assertive manner of helping us through this life-changing transition brings me hope. I feel somehow I am surviving this and that I can and will make the next chapter of my life matter. I just wanted to thank you for treating our matter with such care and swift efficiency. I don’t actually know how to put the experience I have had with Chantal Kur and her company Divorce Mediations into words that truly describe the professionalism and service she delivers with such ease and absolute grace. No divorce is pleasant but she made us feel so comfortable and explained everything in such detail that we walked out of her office knowing we have made the right decision for our beautiful daughter. At no stage do you feel rushed, unsure or insecure about anything – she is open to discussion and I would recommend any person looking for mediation to go this route – without any doubt!!! Divorce can be as bad as death, disability and destitution. One is never prepared for the extreme emotional turmoil and triggers. But through the tumult, if one feels supported and heard and seen, one can find resolve. Chantal Kur at Divorce Mediations is just that support. She sees things as they are, she keeps things real. She gIves of herself and her gifts in mediation far beyond the cash value that she charges. And that is her greatest asset. I am so grateful to Chantal and would recommend her to anyone needed mediation. Chantal Kur conducted my divorce and I can only sing her praises. Professional, gentle and crystal clear with all steps of the process. With her gentle guidance my divorce was finalised in 5 weeks! Thank you always for everything that you did for me. I had dealings with Chantal Kurr on 2 Occasions. Firstly Divorce Mediation in May 2014 and then a Settlement Dispute in November 2015. On both occasions all parties involved left the table happy and satisfied for one reason… due to Chantal’s Calm Professional and Spiritual and Definitely NON Bi-as approach. Not too sure where to start or how to put this into words but I would just like to express my gratitude for your support and assistance with regards to the mediation between myself and Sha. As you know I applied for divorce in 2011 and have changed legal representation twice since then and was still not able to assist with getting our matter finalized. I will never be able to repay you for working so efficiently and for assisting me with a matter that took 4 different individuals over the past 3 and a half years to settle, you have been God sent and I will eternally be grateful to you for everything you have done for me and my kids. Chantal is a very pleasant and friendly person. She immediately laid down the rules of mediation and made it very clear that there is no point in fighting and arguing as we have kids and will most likely be joined at the hip for years to come. As our kids are the most important aspect of our lives, we have decided to be amicable about our divorce. Chantal has removed the pain and hassle factor by streamlining a parenting plan, which will suit all concerned. We have had two mediation sessions and all has been sorted. She has organized for a law firm to do the run around with the court documents saving us the trouble. I do believe that this is the way to go about a divorce. Using lawyers is just costly and time consuming. I would recommend any couples wishing to separate, to go the mediation route. It is the least painful and most efficient way possible. Chantal handled our divorce mediation both professionally and without bias, and kept both parties advised of the process throughout. Thank you for your patience and assistance in settling my divorce. I appreciate your kind hearted and professional approach. Its very seldom you meet people whom are good at and suited for what they do. I would like to thank you for setting up our settlement agreement. During this process your calm and caring manner have really assisted us in closing a sad chapter in our lives, and with your knowledge and guidance you alleviated much of the stress of getting divorced. I would sincerely recommend you and your mediation capabilities to any couple that have reached the end of matrimonial bliss. It was nice to be treated as a human and not just another failed case. Thank you for mediating my divorce. I found that divorce mediation is not only the cheaper option, when getting a divorce, but also quick and easy. You explained the whole mediation process so nicely to us at our first appointment. Every session thereafter you handled with empathy, professionalism and detail. 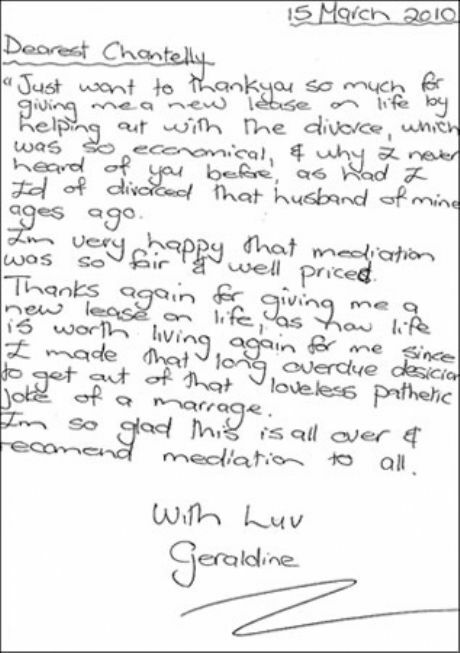 I would recommend Mediation to anyone as a first option, when getting divorced. I just want to thank you for helping with the divorce, thank you for your kindness and generosity. I really appreciate it. May God bless you in so many ways. Thank you for everything. May you have a blessed day. I like to thank you for all your assistance with regards to my divorce. I was present in Court on the 12th January, and now divorced as of that date. I will collect my Letter of Decree on the 21st. I am so happy that I was eventually able to persuade my husband that we mediate rather than litigate! The process with you was by far more beneficial to both of us in that we were able to communicate with civility without resorting to the bickering and mental bashing that would have happened without you. The whole process is still very painful for me and although the divorce is still awaiting a court date, I find that I am able to deal with the situation better having mediated through it. I will always be grateful for your help, encouragement and knowledge but above all your professionalism in dealing with our divorce and I shall recommend your services to anyone I find in need of it as I know you will help others as much as you have helped me. Thank you for mediating between Neville and myself. The two sessions went very well, under the circumstances, and we have managed to resolve the agreement in a friendly manner. Appreciate your time and wonderful calm manner. Chantal Kur assisted me with mediation and I found her to be fair, balanced and productive in her approach towards both myself and the other party during what was an exceptionally stressful time between two people who simply couldn’t see eye to eye. I would recommend her services to anyone wanting to bridge a relationship gap sufficiently to get closure in any situation, not just in a divorce situation. kindness in an already difficult situation. Thanks to the way you handled things, everyone was able to move forward with a sense of dignity and closure. If you are serious about putting the needs of your children first, or would like a cost-effective, transparent and amicable ending to your marriage, then I can highly recommend Divorce Mediations. After years of struggling to come to terms with how to separate emotions from reality, Chantal came to our rescue in the form of an unbiased expert who knows the law inside out but is interested in assisting couples with creating a tailor-made solution for their situations. My ex and I were very worried about the emotional and financial impact our separation would have on our 2 young children, and Divorce Mediations facilitated a solution which we were both happy with, and which we believe is maintainable in the long term. We managed to come to an agreement in 1.5 sessions, and because the interests of our children were the focus of our mediation, we had no legal repercussions with the Family Advocate when we had to submit our Parenting Plan to them. My ex and I have managed to come through an incredibly unpleasant challenge secure in the fact that we did what was best for our children and each other. Thank you Chantal, for treating us with respect and compassion. I would like to thank you for the professional, peaceful manner in which you assisted me with my divorce. Mediation is most certainly the less stressful option to pursue with a situation that is always emotional and potentially volatile. With your steady hand and fair approach, we got through our agreement negotiations with only the minimum of stress. In addition, you might like to know that I followed your clear, concise instructions regarding the filing of paperwork at the court, and on the day of my court appearance, mine was the only divorce granted. This is thanks to you, I followed your instructions to the letter and all my paperwork was in order, resulting in no trauma at all with the final step and a huge saving in attorneys fees. Thank you, I cannot tell you how appreciative I am of everything you did for us. My ex-husband and I came to you in March to sort out our divorce. Not sure that I ever thanked you for what you did for us and for me, but I do thank you, so thanks! The past 9 months has been interesting and I am in a good space now. As a result of my divorce, and getting back into dating I have met a number of married, separated and divorced men. I must say, that having met all these people in various stages of separation, I have been amazed at how long it all gets dragged out for, often even by the person requesting the divorce in the first place. I have handed out your name and number to many people who have been amazed at how quickly and “easily” it can be done. People are astounded that my divorce took 20 days from start to finish. Thanks so much for your assistance earlier this year — you will never be forgotten. Just wanted to let you know that everything went very smoothly in court today, and the judge ordered the decree of divorce with no hesitation. He seemed to be suitably impressed with the paperwork, which was all in order, unlike the advocates who were representing other clients before my case was called up. I was so impressed that he did not find fault in our settlement agreement that you drew up. I would like to take this opportunity to thank you for being an outstanding mediator who puts in the extra effort to show her clients special attention. I am so relieved that I found your contact details through Kelly, who was also kind enough to accompany me today to the court. Thank you again for an awesome job done. Thank you for your assistance with getting through my divorce proceedings. When I first made the decision to get divorced, I was overwhelmed with where to begin, what to do and how to have the conversation with my ex-husband about the important matters, children included. You guided me through one of the most difficult processes of my life thus far. I appreciated your step by step approach; and having followed it exactly as you recommended, I have completed this painful process with minimal trauma. 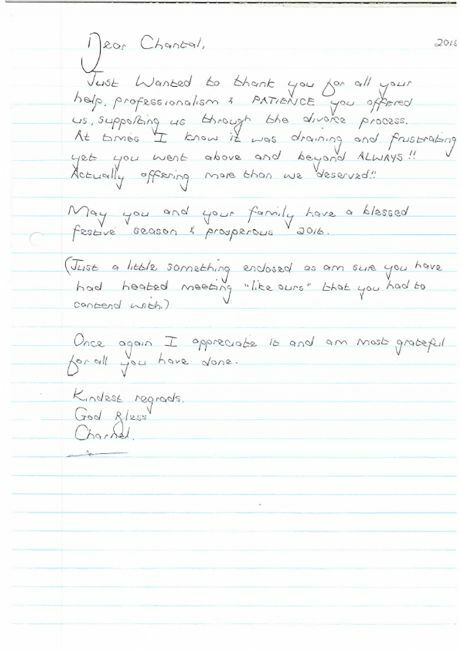 Thank you so much for your professionalism and caring spirit when you assisted with doing my divorce settlement. Because of you, I was born again?you gave me a second chance to rebuild my life. May God richly bless you. Its amazing how through such a delicate process, you gave me a chance to be born yet again? You gave birth to me. I wish to recommend Chantal Kur, She has an amazing talent of being able to handle the most difficult circumstances with grace and compassion. I know from experience that she truly cares for the people she is mediating with. She will go the extra mile whenever she can and has on countless occasions taken a knock financial and emotionally just so that her clients can receive the care and hours that it takes to sort out any problems they may have. If you put your lives in her hands during this difficult time I can assure you that she will hold your hand and walk you through this difficult time of your life. Her agreements are so well done that when my sister went through her divorce I watched couple after couple having their agreements out while Chantal’s went though with no questions asked and she had a minor child in the mix. I got my divorce decree today. Thanks so much for your patience and making that go away so quickly. I am very grateful and happy about the way things turn out and I enjoyed meeting with you. Keep up the good work cause you are the best! Thank you so much for mediating my divorce, if it wasn’t for you…i would still be fighting for what i want. Thanks to you for assisting me in a way i never thought possible. Lawyers doing divorces are just financially driven…you are driven to help others. Thank you for your assistance in previously reaching a settlement. I thank God for this process and service you offer. wish any couple to separate. Your service has however made the process, respectable and manageable. Again I thank you. I trust you are well. Compliments to you. I just want to say thank you so much for everything you have done for me with regards the divorce mediation. It’s been 2 years now and life has been hectic BUT calmed down now. I have met someone and things are going well. Thank you again for being great support and drive for me.